Michael Valenta, Persistent Systems LTD. In Rational Team Concert (RTC) 6.0.4, the ability to associate preconditions and follow-up actions to the SCM check-in operation was added. In this article, we provide an example of how to contribute a follow-up action SCM check-in. Our example is based off of the participant example that is provided in the Rational Team Concert Extensions Workshop. However, instead of configuring the follow-up action using a user interface (UI), we show how you can configure the operation by using SCM custom attributes. The output of our example follows the same pattern as the RTC Extensions Workshop example and is available for download. In release 6.0.4, the ability to associate preconditions and follow-up actions to the SCM check-in operation was added. The following subsection outlines the preconditions that are available out-of-the box in release 6.0.4. The rest of the article focuses on how you can add your own participant to the check-in operation. Restrict Check-in based on number changes in a change set: This precondition ensures that the number of changes in each change set does not exceed the value that you specify. For details about setting preconditions, see Setting preconditions and follow-up actions. In addition to using the out-of-the box preconditions, we can define our own check-in operation participants. In this article, we focus on adding a follow-up participant to the check-in that triggers a personal build on the workspace of the user that performed the check-in. To implement our participant, we made use of the example participants from the Rational Team Concert Extensions Workshop. However, instead of using a UI to configure the participant, we make use of Source Control custom attributes. We defined an IScmExtensionsConstants interface in our common plug-in to contain any constants we define. We defined an operation participant for the new com.ibm.team.scm.server.commit operation using the com.ibm.team.process.service.operationParticipants extension point. We implemented the participant by using the same build code from the RTC Extensions Workspace and SCM custom attributes to configure how the build is triggered. We followed the steps in the workspace to define our feature plug-in, build the update site and deploy the feature to our server. The rest of this article focuses on how we defined and implemented the check-in operation participant and also presents the API available for check-in participants. To define our participant, we use the following xml in the plugin.xml file of the net.jazz.rtcext.scm.extensions.service plug-in. When changes are committed to a change set, a personal build will be requested on the users workspace. We use our component “net.jazz.rtcext.scm.extensions”. We contribute the participant to the check-in operation using operationId=“com.ibm.team.scm.server.commit”. We define our own class “net.jazz.rtcext.scm.extensions.service.BuildOnCommitParticipant” to implement our follow-up action. In the next section, we present the API that is available to the participant and, following that, we present how we use this API, in combination with custom attributes, to implement our participant. In this section, we summarize the information that is available to the check-in participant. getWorkspace():IWorkspace Returns the workspace into which the changes are being checked in. getComponent():IComponent Returns the component in the above workspace into which the changes are being checked in. getItems():List<ICommitItem> Returns a list of objects that describes how each versionable item that is affected by the check-in. getItem(UUID itemId):ICommitItem Returns the commit item for the versionable with the given id. getAffectedChangeSets():Collection<IChangeSetHandle> The check-in operation can affect multiple change sets, so this method returns all affected change sets. getChangedItemIds(IChangeSetHandle changeSetHandle):Collection<UUID> Returns the items ids of the versionables that are checked in to the given change set. For the workspace and component, these are the full objects, so you have access to the name of the item and other attributes. From this, you can also see that each invocation of the participant is scoped to a single workspace and component. getChangeType():ChangeType An enumeration that describes the type of change. The values are ADD_TYPE, MODIFY_TYPE, MOVE_RENAME_TYPE, DELETE_TYPE, REVERT_TYPE, UNDO_TYPE, UNDO_MERGE_TYPE,MARK_AS_MERGED_TYPE which correspond to the types of operations that can be input to the IScmService#batchCommit service method. getBeforeStateHandle():IVersionableHandle The handle to the before state of the versionable or a null if the change resulted in the addition of the item. getAfterStateHandle():IVersionableHandle The handle to the after state of the versionable or a null if the change resulted in the removal of the item. When looking at specific items that were impacted by the check-in, you might want to know more details on the specific item or you might want to know what the path of the item in the workspace is. There are two methods on ICommitOperationData related to fetching the items. cacheStates(Collection<IVersionableHandle> versionableHandleList) This method can be called to fetch and cache the full items for the provided state handles with the data object. The reason for this is to ensure that fetching is done in a performant way and that any fetched items can be reused between multiple participants. getCachedState(IVersionableHandle versionableHandle): IVersionable get the full item for a versionable that was previously cached. It is useful to note that IVersionable is the super interface of IFolder and IFileItem which are the filesystem objects you may be more familiar with. The paths for the items are not always pre-calculated but they can be accessed through the getResolvedPaths() method of ICommitOperationData which returns an object of type IResolvedPaths. This object gives you access to the before path, or the path of the item before the checked-in changes are applied, and the after path of the item. The following points summarize the behavior we want. Determine the build to run based on the component. The trigger can be the file name, the file path, or a custom attribute of the file. We want to associate the build to run with the component. We can do this using SCM custom attributes. The following code shows how we can access the “net.jazz.rtcext.scm.extensions.buildId” custom attribute to determine what build should be run. We simply access the component associated with the commit data and then access the custom attributes of that component. We’ll look at how to define and set the custom attribute later in the article. The above code uses the workspace from the commit data to create a build property that is used to request a build on the user’s workspace. The requestBuild call also sets the personalBuild boolean argument to true. To test whether a build is required, we want to look at all the changed items and determine if any of the changed items were files. For any changed files, we want to fetch the full item of the file, so we can access the name of the file so that we can test it against the name pattern. Like the build id, we store the file pattern as a custom attribute on the component. // If there are no files changed, we don't need a build. // We need to prime the state cache will all the items we may need. // We do it this way so we can get them all in one fetch. // Loop through the files to see if any require a build. // and the after state, which is the state that will be in the workspace after the commit. In our example, we are using custom attributes on the component to configure our commit participant. Custom attributes need to be defined in the process configuration of the project area that owns the component. Once the custom attribute is defined in the project area, it can be set on artifacts owned by the project area using the SCM CLI. Navigate to the project area admin Web client. Click on the Source Control/Attribute Definition link in the menu bar at the left side of the page. Click on the Add button on the right side of the page above the attribute table header. Specify the attribute id and select Component. Click Add. The following screenshot shows the Custom Attribute Add dialog with the id for our buildId custom attribute being specified for components. Custom attributes are set using the CLI. Here is an example of how you could set the buildId attribute for the component named MyComponent. 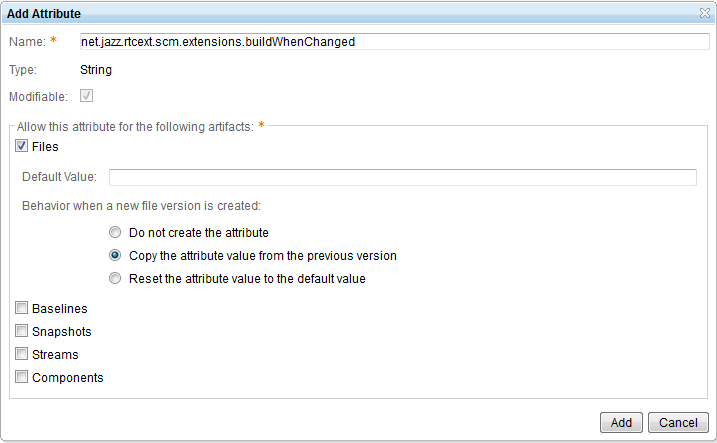 scm set custom-attribute -C "MyComponent" -r https://server:9443/ccm "net.jazz.rtcext.scm.extensions.buildId" "main.build"
There is currently no UI in Eclipse or the web client for setting the value of custom attributes. There is API available to set custom attributes, but that is beyond the scope of this article. Custom attributes on files can be defined to propagate to the next version of the file when the file changes. Accessing the custom attributes for a file version is done using the API IScmService#fetchCustomAttributesForVersionable. Setting the values for files can still be done using the CLI, but the easiest way to do this is to load the file into a sandbox. To illustrate the above examples, we present a simple example. The following screenshot shows the definition of the net.jazz.rtcext.scm.extensions.buildWhenChanged custom attribute for files. We have specified that this attribute does not have a default value and that any values are propagated to new versions of the file. We can set the custom attribute of a file using the CLI, as illustrated in the following example, which sets the net.jazz.rtcext.scm.extensions.buildWhenChanged property of the file P1/src/a/b/C.java to true. Note that this command is issued in the sandbox folder that contains the loaded files. To access the custom attributes on the files to determine if a build is required when a particular file changes, we can use code similar to that shown below. // and the custom attribute may not be available on the after state yet. In this article, we presented an example of how to contribute a participant to the SCM check-in operation and we also illustrated how to set and access custom attributes on SCM components and files. Our example is based on the participant example that is provided in the Rational Team Concert Extensions Workshop and is available as net.jazz.rtcext.scm.extensions.zip. Using this information, you can write your own commit operation participants and also use custom attributes to configure your participants or to provide other capabilities on top of RTC SCM. Michael Valenta is currently the component lead of the Jazz SCM development team. Prior to that, he worked on the Eclipse open source project.